Bandipora: With troops patrolling shuttered streets and separatist leaders locked up, Kashmiris voted on Monday, casting their ballot for better roads and civic amenities. 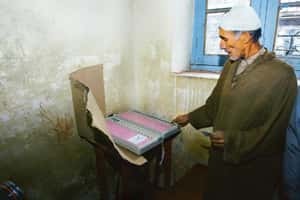 The turnout in three Kashmir constituencies was a little more than 52%, slightly less than in 2002 polls, with many Muslim Kashmiris voting for better local government even if they did not accept Indian rule. Jammu and Kashmir governor N.N. Vohra said the “large" turnout of voters in the first phase of elections in the state is a refection of the people’s faith in the democratic process. “The participation of people in large numbers, despite cold weather particularly in the valley and Ladakh region, reflects their deep faith in democracy," he said. That’s not a sentiment shared by many of the state’s residents. “We are voting for a better candidate who can take care of the roads and better amenities but don’t confuse this with the question of azadi (freedom)," said carpet weaver Ghulam Ahmad in Bandipora in northern Kashmir. “Everyone here you see wants ‘azadi’," he said, echoing the comments of many in the Valley. At least six people were injured when police fired teargas and used batons to disperse scores of demonstrators protesting against the elections in Bandipora town, according to the police.